Over-indulging during the Christmas period is generally a given, and it’s typically followed by a self-promise to get back into shape come the new year by burning off those festive pounds. Spontaneous gym memberships aside, there’s plenty you can do to improve your health and wellbeing by adopting a healthy diet. Your eyesight is especially important during the winter period, with driving conditions being at their most challenging. 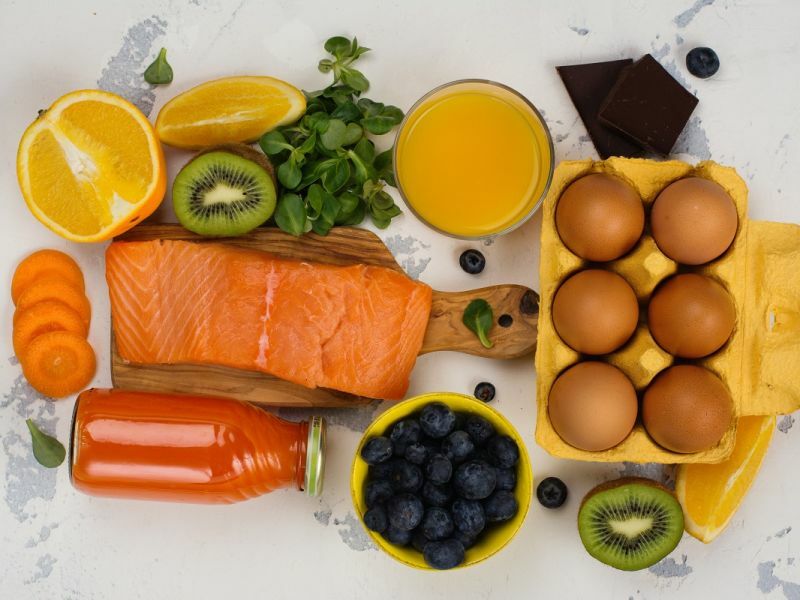 While regular eye checks with an optician can ensure your vision is always as best as it can be, there are certain foods and nutrients you can be eating to help boost your general eye health. Foods that are rich in vitamins and the powerful antioxidant, lutein, can help prevent problems such as dry eye, age-related macular degeneration (AMD) and possibly even cataracts. As you begin to assemble your personal New Year makeover menu, here are some superfoods to include that can boost your vision. Start your day as you mean to go on with some hearty eggs. It doesn’t matter how you choose to have them, each egg is jam-packed full of valuable proteins, vitamins, and nutrients that are very beneficial to your eyes. Eggs contain vitamin A alongside traces of lutein, and so protect against age-related macular degeneration and dry eyes. Containing copious amounts of vitamin C, eating citrus fruits such as oranges and grapefruits are a sure way to boost your immune system and may even help prevent the development of cataracts. Try having a slice of grapefruit with your breakfast or a glass of freshly squeezed orange juice to maintain healthy eye tissue. While greens may be dreaded by many, there can be no denying their health benefits. Vegetables such as spinach, kale, and broccoli are full of powerful antioxidants, lutein, and zeaxanthin. Research has shown that just 10 milligrams of lutein a day (roughly half a cup of spinach) can help prevent vision loss caused by advanced age-related macular degeneration. We recommend sneaking these superleaves into a sandwich, lasagne or even a curry. Better still, for those who shy away from their taste and texture, try adding some leaves to a smoothie – chances are you won’t notice them among strong flavoursome fruits. Naturally rich in omega-3 fatty acids, oily fish are classed as a mighty superfood. Not to be confused with the battered variety found at the local chippy, fresh mackerel, anchovies, tuna, and salmon can all help protect against dry eyes and macular degeneration. Research has shown that omega-3 fatty acids aid tear production, keeping eyes moist and preventing dryness. If you don’t like the taste of seafood, you can try taking fish oil supplements instead. While they won’t enable you to develop night vision any time soon, carrots, along with other orange-coloured fruits and vegetables, are very beneficial to your eye health. They are named after a type of vitamin A called beta-carotene, which is responsible for the orange hue of these healthy foods. As well as being colourful, beta-carotene is beneficial to various parts of the eye, especially the retina. Vitamin A in itself is essential for the healthy development of young eyes. Deficiencies in vitamin A can also cause dry eyes. At Leightons our expert opticians can provide treatment and advice to anyone with concerns regarding eyecare. Get in touch on 0800 40 20 20 or book an appointment online at your local branch. Remember to speak to your GP before taking supplements of any sort, or drastically changing your eating habits, especially if you take any other medications.